For those of us with dogs, the thought of ever losing them is profoundly upsetting. No one likes to imagine a scenario in which their dog goes missing or gets stolen, and, for many, this affords a ‘burying our head in the sand’ approach. Our dogs are family to us, yet while they can be electronically traced back to us if they disappear (unlike humans! ); many people still haven’t had their dogs microchipped. Whatever the reason for this, come 2016, microchipping will be compulsory practice, in keeping with a new government law. From 6th April ‘16, all dogs in England will need to be microchipped and their details registered onto an authorised database. It will be your responsibility to keep these details updated, whether you move house or change telephone number; it is not enough to simply have your dog microchipped and forget about it. After 6th April, if your dog is un-chipped and picked up by police or local authorities, you will be issued a 21-day notice to have it chipped and registered (the cost of chipping is roughly £20-£30). If you fail to do so, you could be fined up to £500. Likewise, if your dog is chipped but its details aren’t registered or updated, you are subject to a similar fine. The law applies to all dogs from 8 weeks of age. Again, it is down to you to ensure your puppies are chipped in good time so that, should they be scanned at exactly 8 weeks old, they meet the legal requirements. If for whatever reason your vet says your dog is not a suitable candidate for microchipping i.e. it is too old or in poor health, an official exemption letter needs to be obtained. It is hoped the new law will help reunite people with their lost and stolen pets much quicker, as well as deterring would-be thieves from offending. Dogs that are chipped and registered with up-to-date details are much more likely to be returned to their rightful owners, and within a much shorter time-frame. Many people also believe that widespread microchipping will deter theft, as new buyers will be able to trace where the dog came from. But the new law doesn’t stop there. It also aims to address the current loophole that means dog owners can’t be prosecuted if their dog carries out an attack on private land. Since 2005, eight children and six adults have been killed by dogs, with most of these incidences taking place in the home. Moreover, in the past 12 months it is estimated that some 2,000 postmen have been attacked on private property by out-of-control dogs. The new law aims to tackle this problem by holding dog owners accountable for their pet's behaviour whether on private property or in public spaces. However, the law will offer protection to owners whose dogs attack burglars or trespassers on their land. Will the new legislation help me find my missing dog? Critics are angry that there is no scanning legislation to accompany the compulsory microchipping law. In 2014 DogLost helped 18,500 lost and found dogs. They helped more than 7,500 get reunited, but that figure coud have been so much higher if scanning dogs was compulsory. "Compulsory chipping is much more about dog control rather than reunification. There is absolutely no point in a dog having a chip if vets, transport authorities and animal welfare agencies are not legally required to scan them. We are working very closely with our colleagues in the Stolen and Missing Pets Alliance (SAMPA) for a change in the law." There have been several recent high-profile incidents where pets and horses have been killed on the road and removed by the police and Highways Agency without any scanning! The owner of poodle Harvey spent thousands of pounds and a huge amount of time searching for her dog which had been killed on the road and never scanned. She could have been informed within an hour of her dog going missing but instead she found out by chance 13 weeks after Harvey had died and been cleared from the road. "The new microchipping regulations don't go far enough and have only been put into place to save money on stray dogs. Nothing is mentioned about the need to scan microchips to help find missing/stolen dogs. It's no good giving all dogs microchips if all vets, agencies and other establishments do not scan for microchips as standard procedure every and any time an animal is dealt with whether dead or alive." My previous dog was microchipped & the chip travelled around under her skin-you could feel it. Reason for my not having my present dog chipped. They should licence the owners as cannot see what benefit the chip is as long as dog carries form of identification. Do you consider chip to be dangerous in any way to the dog? I consider this new law about micro chipping to be excellent. In Australia ALL dogs have to be registered with the council in their area, and if the dogs are M/C, had proper training and have certificates to prove this, they are de-sexed, all this has an advantaged and the registration thus becomes cheaper. I can't understand why this is not done in this country. It would help to control a lot of the dog issues that we have in this country. This is then renewed annually, and if not renewed a fine is issued. have to be Micro chipped...why just Dogs? The Micro chip is necessary for both cats and Dogs when travelling with them from one European Country to another, which many owners do on the Continent. I only wish that the law extended to cats. I am an implanter, a trustee of a cat rescue and the owner of two stolen dogs. My dogs have been missing now for two and a half years. Despite this I still live in hope that one day they will be scanned and returned to me. Passing a law in which all dogs must have a chip it must be made law that all vets, kennels, rescues councils and the police scan any found dog. The law is not benefiting the responsible person who has their dog chipped it seems itâs there to add more coffers to the government purse. Scanning must be compulsory too. I think all pets above a certain size/weight should be microchipped, that way a new prospective owner, is more likely to think about caring for that animal long term, as they cannot just abandon it when they're sick of looking after it, because it would be traced back to them, so hopefully less strays will be the result, providing they are scanned that is, on the down side though, I could imagine greater numbers of animals being inhumanely killed by owners wanting rid of them, so a solution needs to be found for that, rehoming centre's often have a waiting list, which could put people off using them, if they are wanting rid of their animal there and then, so I think a lot more thought should be put into this before the commencement date. Also animals that have been stolen could have their chips removed, as they are so close to the surface, (I can easily feel my pet's chips). Myself and my family have always microchipped our pet's, since microchipping first became available, in the hope our pet's would be returned to us, if lost or stolen, but sadly we lost a cat several years ago, and never did find out what happened to him, so without legislation to enforce scanning, it all seems pointless. This legislation is almost pointless. Why did the government not introduce SCANNING legislation at the same time? Did they forget that a microchip is useless without a scanner?? Of course I recommend microchipping (and keeping records up to date) as it will increase the chances of your dog being returned if lost or stolen. But please don't think that because your dog is microchipped you just have to wait until your dog is found and scanned! Is your vet required to scan? If your dog gets killed on the road must the police or Highways Agency scan? Do the police have scanners at the station? One police station does (in Lincoln) because VioVet donated it to them to hopefully help return missing pets. 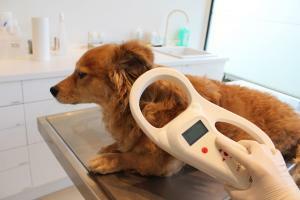 Maybe in the future they'll be some scanning legislation introduced so that the microchipping law can have some use! My dog has a tumour pressing onto the right side of his heart. The consultant told me that he should be 'exempt from microchipping due to a serious health issue, and that his usual vet should fill in the exemption form and deal with it'. Usual vet can't find any link to the exemption form. Please can you provide one so that I can take it down to them? ty.